Summary: I am tired of being used, hurt, and cast aside. My Thoughts: Oh my flipping gosh!! I loved this one to pieces!!!! One of my favorites of the year! A freaking darn good read! I loved Lu’s Legend series but this one blew those out of the water! We are introduced to Adelina who is the best female heroine in a long time! She is strong, brave, kickass, amazing! Well, she’s been abused most of her life so when she gets in a rage with her father, she ends up killing him and goes on the run. She’s always known she was different. She’s a malfetto. But, shes always believed she has no powers. 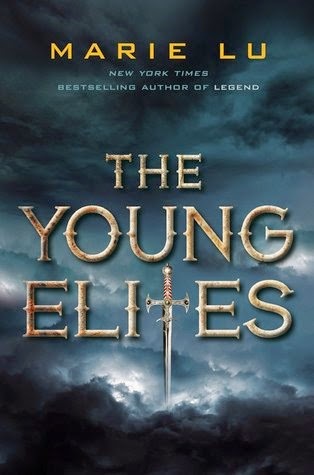 There is a group of Young Elites, what people call them. They are a group of people who are also malfettos but they can do things, great things, powerful things so of course people are naturally afraid of them. They are hunted down and killed. Well, Adalina is soon sentenced to death and the Young Elites come for her. Oh, I loved each of them! I loved Enzo the most! He was so freaking awesome. I loved his attitude and the way he was. I loved him!!!! And so many side characters, and major character development! I also liked Teren, even though I shouldn't. I think there will be more to him than meets the eye. I can’t wait to find out more about him. I loved each of their abilities and I was thrilled to figure out what they were. I just loved the plot, and the characters, and everything. I laughed, I wanted to cry, and now I need the next book! There is so much I could say, I could rant and rave about how amazing this one is but I want to save it for you! I want you to read it, and savor every minute! I don’t want to tell you what we find out about certain people. I want it all to be a surprise! I want you to laugh, to cry, to be frustrated, to want more. I loved The Young Elites to pieces!!! Overall: Did you figure out I loved this one yet? Oh man! One of the best I've read all year! I can’t wait to read more by Lu. I want to know where this series is headed. I must know. I could write pages and pages on this one, but I’ll leave it at this. READ THIS BOOK AS SOON AS YOU POSSIBLY CAN!!!!! Cover: Like it! Its mysterious but cute!